How do you replenish Energy? The only way to replenish Energy is through eating food that you either craft or purchase through Teng Fei. Speed is determined for you; designed to go at the fastest pace you can manage to make it to the next camp. Clothing and certain skills can increase your maximum speed. Current energy and pack weight are a big determinant in your speed. In the top left you max speed vs weight is shown; there are speed pips that can be partially/fully covered up. The more arrows you can see: the faster you are. Who will join my newly created town? If a town is created via the Stagecoach, only players looking to move via the Stagecoach will join you. This means players that have just arrived at town will be in towns that are for new players. This was done so that new players have a chance to experience the town system without being dropped into a veteran town and being overwhelmed. If I move town, what happens to my house? Your house will move with you and be perfectly set up in your new town as it was in your old town. Occasionally, you will be forced to change profession if your current profession slots are taken up in the new town; this will result in your machine changing when you arrive in the new town. How can I change profession? If there is an open house slot available in your town, then you can just click on the plot and you will be given the option to move to that plot and hence profession. Gold is a shared town currency; this means other players can spend that Gold. You earn this Gold together through the Warehouse that you all work towards filling and so everyone has the ability to spend it. Coordinating and communicating with your fellow town members is key for getting the most out of this game. What can I do if a player is being rude? Contact Customer support with your town name and their player name. Is there a faster way to move items on screen without dragging all the time? You can double click items on The Trail to instantly drop them into your pack and also double click to put items onto crafting grids/the Trading time conveyor belt. Try double click when you want to use and item and it will perform the appropriate action based on where you are in the game. When will the trader take things from my warehouse? Once all 5 boxes in the Warehouse are filled, then the trader will arrive within a minute; give Gold and Chits, clear the warehouse and give you some new boxes to fill. Why are things are missing from my shelves/machines? Shelving is a sharing platform, you can put things on there for players to take (and indeed leave things on other people’s shelving for them to take). If you want your own storage; use a Private chest from the furniture catalogue. Machines are similar and open for everyone in town (as everyone needs things from each others machines); you can fill someones machine and then take the product for yourself or just stock it for them out of the goodness of your heart or take the products that your neighbour has done all the work in creating! You can have neutral, good and bad neighbours, which will you be? What happens when I collapse? You will drop a lot of items in your pack and will be sent to the previous camp where Teng Fei will offer you some food for Chits to help you through the next section. If you’re low on Chits, maybe Teng Fei be a bit more generous! Your dropped items will be waiting for you on The Trail for a certain time. View the map to see them. How often can a mayor change? Once a day there will be an examination to see if anyone has a more impressive house than the current mayor, and this can cause a change in leadership. No, you will need to manually move save files between PCs. There is no real reason to feeding the bird, other than it being good to share and it makes the bird happy! How do I upgrade my bag size? You can exchange Favours for larger bags at Teng Fei’s shops that are scattered across the campsites along The Trail. Why do I lose the items people don't buy during trade? You don’t lose items during trades, you actually sell them! Even if another player does not purchase that item, when your item reaches the end of the conveyor you will receive Chits (although you will receive more if another player purchases it). If you wish to keep your item to try and sell it for a higher price with another player then you can remove it from the conveyor before the end at no cost and then take it to the next campsite. It is up to you to decide if you prefer guaranteed Chits now, or the chance for more later on! Can I go back to collect supplies I missed? This depends on a two factors; your stamina and the other players that pass you. When you pass out you are able to get up immediately in exchange for Favours or you have to wait until your stamina has recovered. If you choose to wait then your stamina will slowly recover but items will gradually fall out of your bag, and people who pass you can take them. Your clothing and the items in your pockets will not be taken, so you can protect your valuables! Yes, you can; when pressing Koko the bird, there is a button to cancel your current quest so that when you arrive at the next campsite Beatrice will give you the opportunity to choose a new quest. What benefits do I get from buying a plot of land in a town? Houses and towns are a huge part of The Trail! When you buy a plot you will automatically build a house and join a town. You can then work together as a town to unlock civic buildings which do a variety of things such as; allowing you to chat with your fellow settlers in your town, better access to large quantities of wood in the Logging Field, and many other features. Houses also give you a profession and you can make money by selling items you make using your house machine. You can spend Chits on furniture for your home that will allow you to store rare items and clothing in your house, and they can also give you buffs; such as increasing Chits receive for items you sell. You can fast travel between your town and your last visited site on The Trail. How do I upgrade my property in town? You have item requirements needed to upgrade your house, and once you have collected all these items you can place the items in the upgrade box and pull the upgrade lever in the house. These upgrade items are often from the machines of various professions across the town and so you need to visit other player’s houses and use their machines as well as your own and even work with other settlers to upgrade your house. Can I change my profession in town? You cannot change profession once you have chosen one, however there is no real advantage in one profession over another one. You can use other people’s machines (the large object in houses that convert specific trail items into more useful items) in their houses in order to help yourself and others in your town. There are a set and equal number of each profession in a town. Can I transfer my save data to a new device? Yes, you can access this option in the Settings Menu, which can be found by accessing the menu in the bottom right, and selecting the “I” button for info. How to chat with other players? When you are a part of a town you can work with your fellow town settlers to unlock a building called the Saloon. Once the Saloon is unlocked you are able to talk to the other people in your town at all times on The Trail and in town. Where do I get specific items I need for my quests? You receive items all across The Trail. The map will tell you where certain items are more prevalent and you can then travel there using the map and collect the items you want! How do I create my own Abodes? Use sculpting to clear a level area of land until it’s large enough for a plot to appear. Tap on an abode or settlement in close proximity to spawn a follower (applicable buildings have a small follower icon above them). The follower will automatically navigate to the plot and begin building the relevant abode. How do I remove my Abodes? In the bottom left of the screen open the ‘Belief Menu’ with a tap on the pink button. Choose the bottom option of ‘Powers’ and the god’s power menu will open up. Find and select the ‘Finger of God’ option from the menu and you will be returned to your world with the power. Select the abode you wish removed and the power will be applied, larger abodes and settlements may take multiple taps. As long as you have belief you won’t need to reselect the power! How do I convert the Astari? When the Astari begin to appear around your settlement the happiness bar will follow shortly. This bar shows a top (Happy) to bottom (Miserable) scale of both you and the Astari’s happiness. Each hour (on PC) or 24 hours (on Mobile) the Astari will hold a festival at their settlement and whichever civilization’s happiness is higher will win over an amount of the others followers to their side. The follower mood of both civilizations can be affected through a range of god powers which will be indicated by the small face icon next to each option in the ‘Powers’ menu. You can also improve your own followers happiness through gifts (Mobile Only) or rescuing lost followers and leashing them home to an abode. How do I rotate the Camera on Mobile? To rotate the camera on mobile, place two fingers on the screen and move in a circular motion. It’s worth noting that rotating the camera will not be a permanent change of perspective. This is to get a new angle on your sculpting work or for a screenshot. It will rotate back to the standard position the next time you interact with the world. How do I rotate the Camera on PC or Mac? To rotate the camera on desktop use the Q and E keys to spin the camera around. How do I start Farming? As you progress you’ll unlock the ‘Farming’ card and that allows the creation of the ‘Farming Settlement’. After creating a ‘Farming Settlement’ you will be able to start production of farms to produce wheat. Wheat is essential for continued expansion in the middle stages of the game. To create a ‘Farming Settlement’ click the pink ‘Belief’ button in the bottom right corner of the screen. Select the ‘Settlements’ option from the menu. From this menu, find the ‘Farming Settlement’ option and select it. When you are taken back to your world you will now see a white ring on your screen, every abode highlighted inside this ring will be squished into a ‘Farming Settlement’ when you’re satisfied with its position. Over time Farmers will be created inside the settlement (Check the Settlement information panel to find out detailed information about the creation times). Once finished you will be able to spawn them like any other follower but instead of building a new abode they will build a field. When this field is full of wheat a floating grain icon will appear above the field and they can be harvested in the same way as belief. How do I Re-Home Homeless Followers? When a follower has lost their home simply leash him to an empty plot to have him construct a new one or leash him to an existing abode with some free space to have him move in. Information on how many followers currently living in an abode can be found in the abode’s information panel. After you unlock the ‘Mining’ Card and ‘Farming Settlements’ you will be able to start constructing Mines to produce Ore. Ore is required for expansion during the later stages of the game. To create a ‘Mining Settlement’ click the pink ‘Belief’ button in the bottom right corner of the screen. From this menu select the ‘Mining Settlement’ option. Selecting this will now give you a white ring on your screen, every abode highlighted inside this ring will be squished into a ‘Mining Settlement’ when you’re satisfied with its position. Over time Miners will be created inside the settlement (Check the Settlement information panel to find out detailed information about the creation times). Once finished you’ll be able to spawn them like any other follower but instead of building a new abode they will build a mine. How do I create a Builder Settlement? When you’ve unlocked the ‘Building’ card and ‘Farming Settlement’ you are now able to start constructing mines to produce wheat. From this menu find the ‘Building Settlement’ option and select it. When you are taken back to your world you will now see a white ring on your screen, every abode highlighted inside this ring will be transformed into your building settlement. When happy click the confirm button and your settlement will be created. How do I create a Farming Settlement? When you unlock the ‘Farming’ card and ‘Farming Settlements’ you will now be able to start constructing farms to produce wheat. Select the second from bottom option of “Settlements”. From this menu find the ‘Farming Settlement’ option and select it. When you’re taken back to your world you’ll see a white ring on your screen, every abode highlighted inside the ring will be squished into your ‘Farming Settlements’ when you’re satisfied with its position. When you’re happy click the confirm button and your settlement will be created. How do I create a Mining Settlement? After you unlock the ‘Mining’ card and ‘Mining Settlement’ you will be able to start constructing mines to produce ore.
From this menu pick the ‘Mining Settlement’. When you are taken back to the game world you will now see a white ring on your screen, every abode highlighted inside this ring will be squished into your ‘Mining Settlement’ when you’re satisfied with its position. How do I build Treasure Temples? Throughout certain points of the game you may come across colourful rocks. Sculpt the land around the colourful rocks. After sculpting you should see a grey sculpture (Treasure Temple) buried within the land. Remove all the surrounding land covering the Treasure Temple. Leash your Followers to the Treasure Temple to start construction. After the Temple construction has been completed, a card will appear. Tap on the card to collect a reward. We’ve noticed that some users are have a little trouble building Treasure Temples – When leashing Followers to the Treasure Temple they won’t start construction. This is often due to a tiny piece of land found within the Treasure Temple. Try rotating the camera to a different position and try sculpting the land again. If in doubt…Meteor the Temple! Stormy Weather and Blue Skies cards have incorrect descriptions! Why is this? Stormy Weather and Blue Skies are currently displaying the incorrect details. Our team are fully aware of this and we’ll be correcting these details in a future update. Once we have more news about this we’ll be updating this FAQ. Leashing doesn’t seem to work for more than one group of Followers! Is there a fix? If the user leashes a second set of Followers to the same location as a previously leashed first set, then the first set of Followers can have their Leash cancelled without the user’s input. Once we have any additional news about the fix, we’ll update this FAQ. Story chests are appearing in Weyworld! Should this happen? There is a small chance the a storm generate a story chest within Weyworld. Although the story hasn’t been implemented to Weyworld just yet. Clicking on these chests will open up the Journal to a empty page. We’re currently reviewing this bug and we’ll be sharing some additional news within the near future. Why can’t I do anymore Voyage missions? Voyage Missions have been temporarily disabled and we’re currently look at new, fun and interesting ways to implement new voyages missions into Godus. Once we have any additional news we’ll be updating this FAQ. f you’ve linked your Godus account to Facebook you may notice some ghost beacons have started appearing around your world. These unusable Beacons with a little green orb above them show how far your Facebook friends have progressed through Godus! 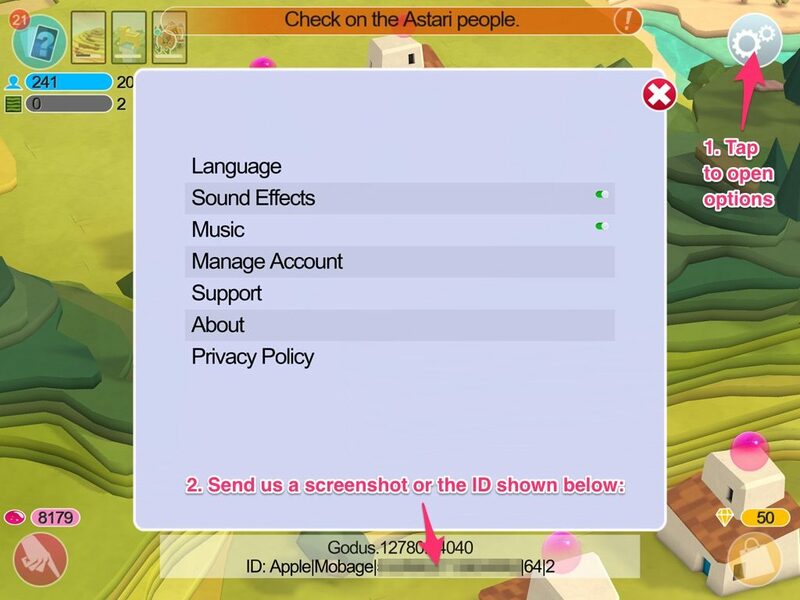 Some users have reported that Godus will become stuck on the Authorisation screen. This could potentially be down to the user changing details on Facebook such as email address or login password. If you’re stuck on this screen, please try deleting and re-downloading Godus, after this you’ll be able to log back into your account, please make sure that you recover save your save as well, otherwise you’ll be starting a new game. Each gem chest within Godus has a unique ID and once collected this ID is added to your account. Once collected you won’t be able to receive gems from this ID again. As chest ID’s linked to your account they are carried over to new games as well. This has been causing some confusion with users who have been trying to collect them and not receiving any gems. Losing your save to corruption or a bug is never fun and we take this very seriously. If your save has been reset in any way, please email godus@22cans.com and one of our dedicated support team members will help you to recover your save. Some users on Android devices have reported that Godus takes longer to load up after Update 6. Since then we’ve release another patch that has fixed this issues, please visit your Google Play Store to ensure that Godus is currently running on the latest version. If the user converts some of the Astari Followers to their own, (this is done by having a higher happiness rating than them when the Astari Festival ends) the newly converted Astari will often not make it to be added to the user’s Settlement as they’ll get stuck on their way. We’re looking into this bug and will update the Support questions when a fix has been achieved! If the user has a very large number of Followers, the AI can be seen to work a little slower than normal. Sometimes the Followers will come out of their Abodes up to ten seconds after being instructed to do so – sometimes not at all – and at other times, the game will simply crash. This issues is currently being looked at and once we have any additional information we will update this FAQ. This issue is now in our bug database and we’re hoping to address and implement a fix within a future update. Once we have any addtional information we’ll update this FAQ. When using Rain of Purity, the cursor’s location (apparent when you go to click the ‘X’ to end the God power) is at the centre of the cloud, rather than at the power’s target location. However, when using Finger of God, the cursor’s location is quite a bit below the graphical representation of the finger, at the target of the power. The result of this is that when the user tries to hit the ‘X’ to cancel the God power, it can be quite jarring, as the cursor is inconsistently-placed relative to the graphical representation of the power. Once we have any additional information for this bug we will update this FAQ. If the user collects a Story chest, and then either restarts the application, or moves to a different world and returns (Events, Leashing Tutorial, etc), they will lose any previous Story text that they have previously collected. We’re currently looking into this issue and once we have any additional information, we will update this FAQ. Where are my Kickstarter Backer Rewards? We are still in the processes of fulfilling all rewards that were included as part of our Kickstarter. Many of the rewards have already been fulfilled and received by backers! These included Alpha and Beta keys, t-shirts, posters, the game developer livestream, the monthly design calls and the books. If you are missing any of these rewards that you qualified for, please get in touch ASAP through submitting a request or by emailing support@22cans.com. I haven’t receive my Steam key yet! Where is it? Your Steam key will have already been sent to you via e-mail, the address being the same as the one you used on Kickstarter and/or PayPal. If you qualify for multiple keys you should receive several keys. In rare cases, some e-mail providers might have sorted the email into your Spam. If you think you weren’t sent a key or you can’t find it, then please get in touch via the ‘submit a request’ page or e-mail us at support@22cans.com. It helps speed up the process if you include your name, the level you backed at and whether it was on Kickstarter or PayPal. If you purchased your key through Steam Early Access, GODUS will have been added to your Steam Library. Please send review copy requests for any of our titles to pr@22cans.com and we will assess each request individually. If you would like to conduct an interview with Peter Molyneux or another member of 22cans, please contact us at PR@22cans.com with details of the interview and your publication. Can I make a ‘Let’s Play’ video of your games? As an individual, you are allowed to record and upload footage of our games. You are also granted permission to monetize these videos on your YouTube channel. As long as the purpose is not aligned to a political, religious or charity movement. We do ask that you include a notice message either in the video itself or in the description accompanying it that it is not an official video and that anyone interested in our games can visit our website at http://22cans.com. Also, we’d love to see your final videos and may feature them in our updates. If you would like your video to be considered for inclusion please get in touch with us at Support@22cans.com (be sure to include a link to your video). Thanks again for getting in touch! I’m looking for a job! Are 22cans hiring at the moment? We list all our job opportunities on our website’s front page. Can I send things to 22cans? I’m looking for Work Experience or an Internship. Can I apply? From time to time, we do accept work experience placements and internships. The latter is something we would publicise on our jobs page. Internships are mainly in the programming field, while work experience is organised on a more informal basis. If you would like to inquire about work experience, please get in touch via info@22cans.com with your CV and a little bit about yourself including your availability. Can I visit the 22cans studio? We are very busy with the development of games and all things 22cans, while we would love to accommodate visitors, it is not possible. We do occasionally host focus tests where we will invite players and fans to come to our studio to play our games and give feedback. When we host a session, they will be advertised on our Twitter, Facebook and our other social media outlets!